The attack at the Tree of Life congregation in Pittsburgh was a shocking reminder of the threats facing Jewish communities everywhere, and it prompted a re-examination of the measures we are taking here in Cincinnati. At the Jewish Federation, we have received dozens of questions about security. We are sending this update to help answer those questions. Five years ago, Cincinnati was one of America’s first Jewish communities to launch a community-wide security program—SAFE Cincinnati. Since then, with extensive investment from The Jewish Foundation of Cincinnati, our Federation has helped SAFE Cincinnati improve the security of our synagogues, schools, and community agencies. These initiatives have focused on “target hardening” to deter attacks and readiness in the event of an attack. This year, SAFE is adding attack prevention strategies. These new intelligence gathering efforts include monitoring social media and are coordinated closely with federal, state, and local law enforcement. Immediately after the Pittsburgh shooting, we increased security guard presence at Shabbat services at our synagogues. We are also helping all of our organizations utilize their greatest asset—their active participants—to use their observational abilities. Please urge any Jewish organizations you are involved with to form and train volunteer security teams. SAFE Cincinnati would be glad to assist each organization in training these teams. 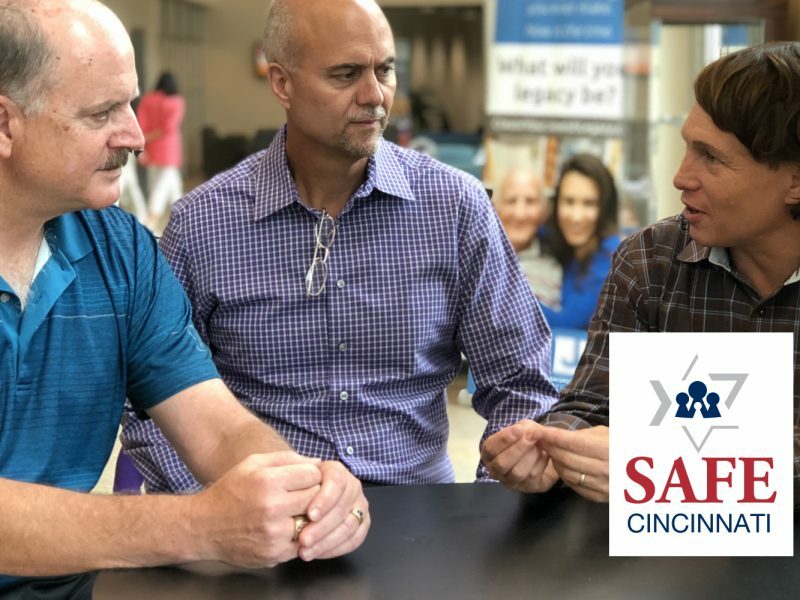 SAFE Cincinnati Director Ken Wall is available to discuss security at our congregations and agencies. He can also consult with anyone planning events within our Jewish community. Ken can be reached at kwall@jfedcin.org or 513-985-1583. Recent increased security is in response to natural concern across our community. At the same time, it is important to note that the threat indicators that law enforcement track show the same general threat level in Jewish Cincinnati as they did before the Pittsburgh shooting. Law enforcement has not seen a recent increase in antisemitic activity locally. Nevertheless, our Jewish Community Relations Council (JCRC) continues to monitor antisemtism. The JCRC coordinates closely with SAFE Cincinnati and advises organizations and individuals about responding to antisemitism. You may contact JCRC Director Jackie Congedo at jcongedo@jfedcin.org or 513-985-1501. We will keep you up to date about security training opportunities and if the threat level changes. Maximizing our security is something that none of us can do alone. We can only do it together. Thank you for helping to keep Jewish Cincinnati safe.